Toward the end of Sting's 60th birthday bash at New York's Beacon Theater last night, Bruce Springsteen took a moment from his set to joke about his friend. "I've known Sting for about 25 years," Springsteen said. "But our friendship is a little unusual, because every time I read about Sting in a magazine, I don't recognize him. I've read, 'Sting can make love for 29 hours.' I wonder why he never mentioned that to me. After four hours now, you're supposed to seek medical attention … Anyway, stay hard brother, stay hard." Sting's 60th was full of surprises. The charity event (all proceeds went to the Robin Hood Foundation to fight poverty) featured a stacked lineup including Lady Gaga, Billy Joel, Stevie Wonder, Herbie Hancock, Rufus Wainwright, Mary J. Blige and will.i.am – all covering Sting's songs joined by the man himself. "Sixty feels comfortable – I've always felt sort of old," he said early in the night. But most of the time, he looked boyishly ecstatic, whether grooving next to a moon-walking will.i.am. or sitting down on a riser to watch Herbie Hancock play a piano solo on "Sister Moon." The setup was massive, with at least 20 musicians onstage including a string section and backup singers. Sting appropriately kicked off with "Englishman in New York," followed by "All This Time" "Seven Days" and the funky, slinky groove of "If You Love Somebody Set Them Free." He introduced will.i.am., fresh off headlining Central Park with the Black Eyed Peas over the weekend. Will.i.am reinvented "Walking on the Moon," freestyling and working in some lines from "I Gotta Feelin'" "Tonight's gonna be as a good night/ tonight's gonna be a special night.'" Afterward, he recalled being a kid in the projects, borrowing a friend's Police CD. "Now I'm onstage, singing with him on his birthday," he said triumphantly. Other duet highlights included Rufus Wainwright delivering a stellar "Wrapped Around Your Finger" and Sting's with his son Joe Sumner on an emotional "Why Should I Cry For You?" about Sting's tough relationship with his father. Billy Joel hasn't played a proper concert in two years, and he was last onstage when he played with Paul McCartney at Yankee Stadium in July, so it was good to see him back. He sounded great, taking a seat at the grand piano and nailing the high notes in "Every Little Thing She Does is Magic" and "Don't Stand So Close to Me." After his set, though, he confusingly put his hands around his neck, mock-choking himself with his tongue out. He could've been implying he wasn't pleased with his performance, though everyone else was. Next was Lady Gaga, who sat at the piano in sunglasses and a sparkly dress with extra-broad shoulders, rocking back and forth while howling a powerful take on the Police's "King of Pain." Giving the same kind of vocal passion she gives on songs like "You and I," she made it truly sound like a Gaga song. Next, Stevie Wonder walked center stage to sing a soulful "Fragile" with Sting (surprisingly, Wonder didn't play piano the entire night) "How do you follow that?" Sting asked the crowd. " But you can…"
Echoes of "Bruuuuce" rang through the Beacon. Sting left the stage and Springsteen emerged with his Fender. Like Joel, he also hasn't been on the road in a while, but looked ready for action, beginning with a haunting cover of Sting's "I Hung my Head." A ballad about a man sentenced to death after accidentally shooting someone, it was quiet until Springsteen ripped into a blistering solo that became the night's peak. Next was a stirring, emotional "Fields of Gold," which he called one of his favorite Sting songs, performing solo with a 12-string guitar and harmonica, singing one verse entirely acapella as the house went quiet. Sting then joined him for a raucous "Can't Stand Losing You," as they roared into the same mic, leaning over eachother. How do you follow that? The entire cast soon joined Sting to trade lines on "Every Breath You Take," Gaga singing "Can't you see / You're the one for me" while pointing to a grinning Billy Joel. Sting even kept going, with a solo acoustic "Message in a Bottle." He thought the night was over, but soon wife Trudie Styler appeared onstage in a tight dress, inviting dozens of Scottish bagpipers onstage, who played while confetti fell. Sting was visibly moved, and even as the crowd filed out and the stars left, the couple stayed onstage dancing. "Thank you a million times," he told the audience. 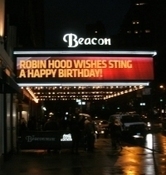 Sting I hope your birthday was as magical as your Music....Happy Bithday! You are an amazing person, and an intresting Soul!